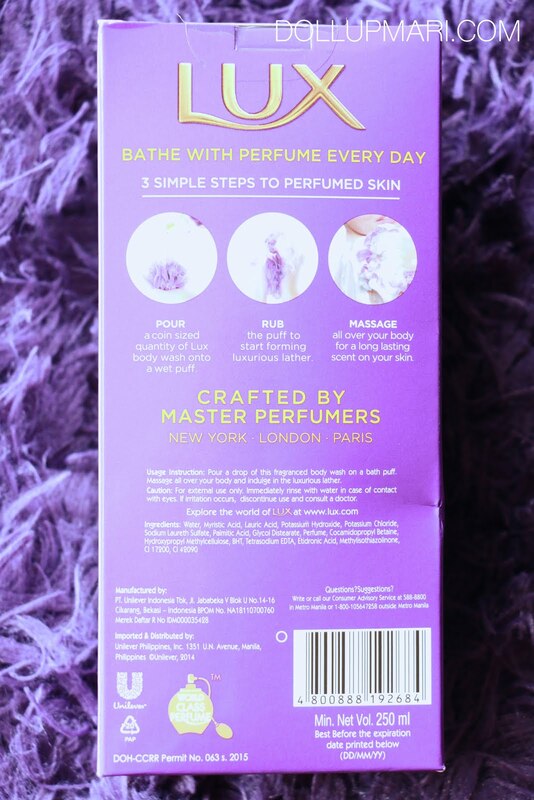 Bathe with perfume! Bathe with Lux! IT'S FINALLY BAAACK, Y'ALL!!! I am really very happy that Unilever decided to bring Lux back because it's one of the brands that makes the best body washes ever. I remember that my most favorite body wash was one small Lux one that my aunt gifted you. 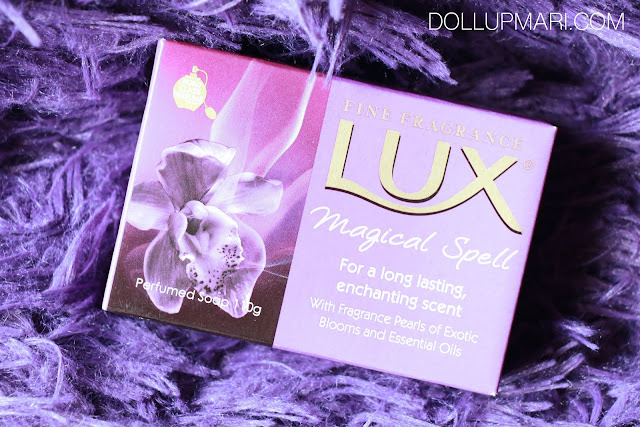 I loved the fragrance so much it got to the point I was using half what my body actually needed just so I could prolong using the product as there's barely any place that sold Lux here. For quite some time, you can only find Lux in Chinatown delis, or in small beauty retailers that sold imported knick knacks from all over Asia. I have no idea how this is supposedly Unilever's redemption, but it felt like mine. When I was buying this in the supermarket near our place, I was like yaaaaaas I don't need to suffer with half-dosages of body wash because I can flood myself with so many Lux products now. 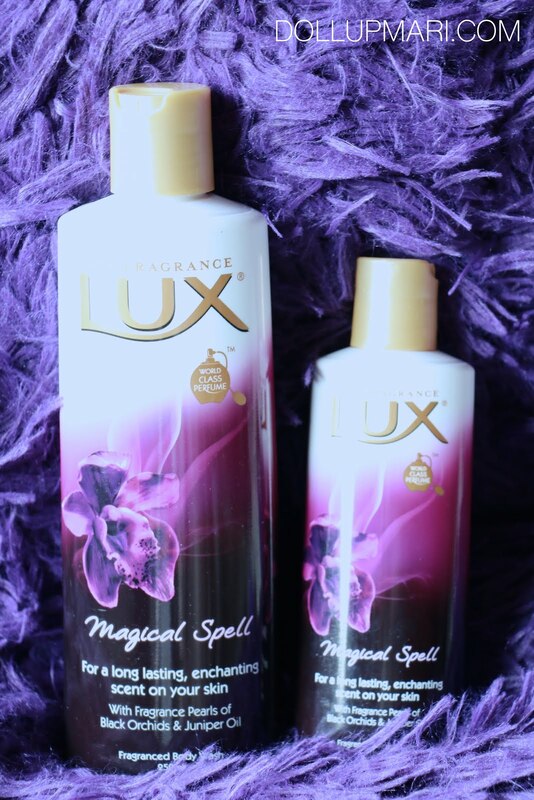 Oraaaayt, so this is my Magical Spell body wash. Lux comes in quite a lot of fragrances (there's Love Forever-- the black one, White Impress-- the white one, and Soft Touch-- the pink one) and comes in bar form, too. I just had to get this limited edition box because of the suuuper cute bath puff it came with! I have yet to meet someone who is not excited over a pretty purple bath puff... This one is at a promo price of Php120 for a 250mL bottle and a bath puff. 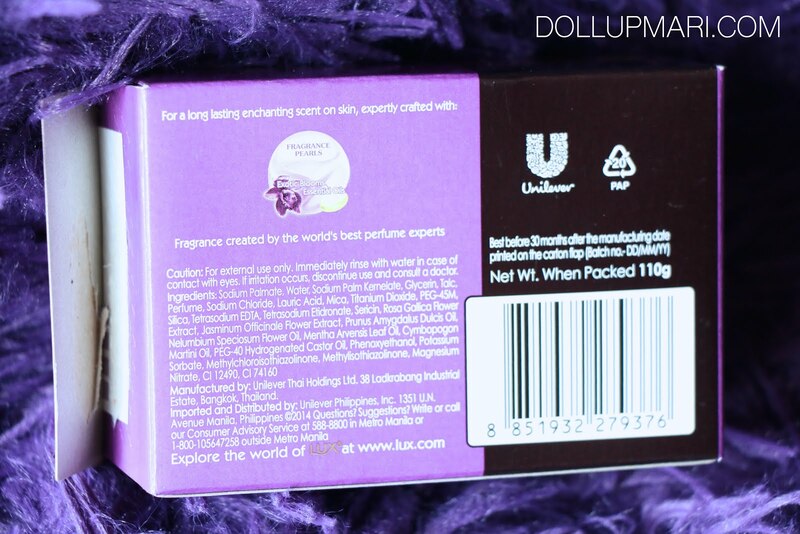 The small one (100mL) without a bath puff is at Php55 in most stores. Amusingly, I've only found this in Merkado supermarket so far. Here's the description on the box. Kindly zoom in this photo to see the ingredients as it is really hard to read them at this rate. This is my 250mL bottle and my 100mL bottle. Of course, there's more value for money with the big one as it's just Php0.48/mL for the 250mL bottle versus Php0.55/mL for the 100mL bottle. But I guess it was really thoughtful of them to make these 100mL bottles that these are so perfect for travel. And I know all of you guys are dying to know how this smells like! And here I am to ruin your expectations because I can't describe how it smells like! Woohoo! All I can say is that I really love the scent-- it's a dark, sensual and luscious scent. It's very woody, and it's got a really mysterious feel to it. It's not a clean, citrusy scent. It's floral-woody with a touch of darkness. But I can't really liken it to anything else I've sniffed in my life, nor breakdown the fragrance to its components. I now understand why I can't liken it to any component because there are simply so many components that went in into this fragrance. It's really a great experience whenever I use this because the scent really dominates the bathroom. Like the whole time I am using it, this is the only thing I can smell. It washes out the scents of my shampoo, the odors of the bathroom, and basically every other fragrance. Amusingly, when I come back to the bathroom the next morning, it still smells like this. I've been extremely stressed out the past few years (I initially typed 'months' and realized that i've been a stressed wreck since 1902) and can barely go through any ten minute period without worrying about the things I have to rush. I like how I get so smitten by the fragrance that I can forget all my worries for even just a few minutes each day. And yaay, it comes in bar, too! But this smells very different. This smells a lot like sampaguita, and it smells a lot less dark compared to the body wash form. But at least this is cheaper at Php40 for a 110g bar. This smells very, very floral and it's the jasmine and patchouli dominating the scent rather than the black orchid (presumably it's this because the body wash smells so dark and this flower comes with the word 'black') that dominates the scent of the body wash.
For the concerned citizens out there, here are the ingredients of the bar. Packaging palang, looks like luxurious na. Na-engganyo tuloy ako itry kahit yung maliit lang, base sa review mo Ms. Mari! Very informing ang review mo!